This instrument can accurately detect wool or cotton and man-made fibers blended in sample wool or cotton content of percentage. Mixed samples in advance drying and weighing, dissolved in automatic control doses of chemicals. Surplus components again drying, again weighing. Adjustable pre drying, again drying and dissolve time and displayed. 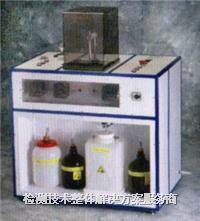 Can pre-settings program control air drier temperature and chemicals slot temperature. Users can install additional programs.